Tom B. in Colorado with HP Velotechnik Street Machine in foreground. I wanted to send out a message to you for your guidance in helping me prepare for my cross country bicycle trip…which I finished about a month ago now. When I came out to see you…about 2.5 years ago, I hadn’t owned a bicycle since high school. I was then 49 years old… it had been a long time. As I planned my trip, I wasn’t tied to any particular bicycle and thought a lot about the type of bicycle I wanted to ride. I decided that riding that long distance on a diamond frame, on a small seat crammed up my but and staring at the ground wasn’t the posture I wanted. I also wasn’t in a race with anyone and my goal was to ride and appreciate the beautiful country as I peddled across it. 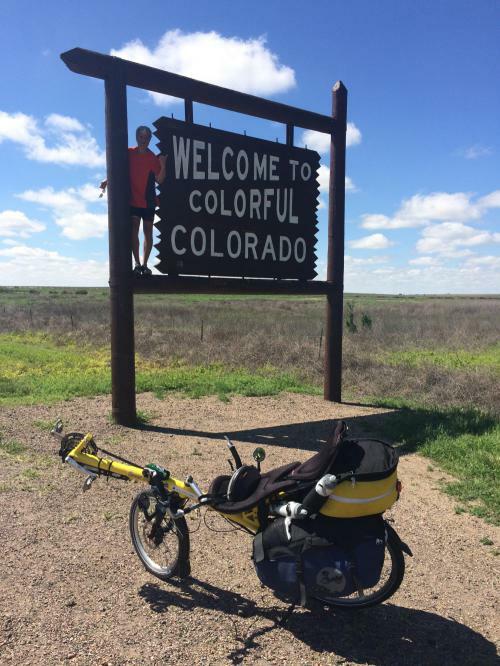 I decided that I wanted to ride a recumbent, which I knew very little about. As a matter of fact, even just 2 years ago, there wasn’t much literature on them either. My daughter got your information for me at a bicycle event she attended in NYC. She also knew I was looking for a recumbent style bicycle and when she found you and your bicycles, she was excited to get me your contact information. I called and set an appointment with you and we spend a lot of time talking about how I was going to use the bike. We talked about what was important to me and considered a few options you had. You kept talking about the HP Velotechnik being the Mercedes of the recumbent bicycles. It’s actually the bike of choice for many national, international and world wide bicycle travelers. It’s durable aluminum frame, light(er) weight and plenty of paniers and storage space to accommodate such a trip was beautiful. Due to my error during my first week on the road, I slid off the shoulder of the road and fell down a rut going about 15 mph. I jacknife’d the bike and it flipped head over heals. Outside of a few scratches on the bike, it was perfect and I got up to ride as if nothing had just happened. It’s built like a tank. It was extremely comfortable to ride. Spending all your time laying on your back, perched up so you can see the landscape as you peddle through different scenes and around new bends…while literally staring at the horizon was unbelievable. It kept me pedaling and wanting to see more. I was never exhausted and my body never ached. Unlike many of the friends I met along the way who suffered from saddle sores, put this sticky stuff on their butts to avoid chafing…. all issues I never had to even think about. No sores, no aches and a fantastic experience. As you can imagine, we hit some pretty windy weather heading across Kansas, Colorado and the mid west. Since we were heading west, the winds were mostly out of the west and we battled the wind at our faces a lot of the time. The wind at your face is always a factor, but it wasn’t that bad for me. The posture I ride in on the recumbent makes me incredibly aerodynamic and the wind rode over me with significantly less drag compared to the diamond framed bikes, which acted like a parachute….or they had to squat down real low, stare at the road again to get through the rough parts. I really didn’t miss a beat and was present in my trip, enjoying the day and the ride all the way to the end. The other thing I enjoyed about this bike was just how fast it was. This bike loves to roll down hills and on the flats. I would often have to put my brakes on and hold myself back while rolling down a hill if I was in conversation with someone else….or others would be peddling hard just to keep up with me as I coasted down hills. There is something else I noticed. I call it rolling stamina…. Even as we leveled out at the bottom of a hill…. My bike kept on rolling and slowing down on the flats much slower than any other bike. It would keep rolling and rolling. Often times, I would roll up a hill to the next down hill and laughed to myself while others would be pedaling to climb the next hill I just rolled up. I was asked several times if I had a motor on my bike…. and of course I didn’t. I think I won over several people that were asking great questions about my bike and conceding they would look into a recumbent like mine. It was such a superior bike and made the trip so much more enjoyable for me. I was able to ride the entire Trans America Trail from start to finish without once stopping to rest or push up a hill. I did have to work a bit more climbing hills on a recumbent, but the low gear ratios helped out significantly and any time I lost during a climb, I more than made up for on the down hills or flats. To give you an idea, my cruise speed on a flat road, no wind was about 20-22 mph. This was cuising. Not pushing…. medium effort and enjoying my ride kind of effort. This bike is incredable. I max’d out at 53 MPH out east, in the blue ridge mountains. The bike wanted to go faster… and I would have let it if wasn’t for the switchback turns. I had a blast and wanted to thank you for sharing your experience and knowledge with me. We picked the right bike and I’d never ride another bike. I’ve grown fond of my HP Velotechnik Street Machine. Tom’s Street Machine Gte while I was building it. I was smitten by the gold-yellow custom paint. If you’re curious, these were Tom’s bike specs. This is a factory build with the standard factory upgrades. We didn’t do anything particularly unique for him.